There are a lot of courses in the market that promises to work like a magic pill. Some promise to take your career to new heights just by doing that ‘one unique’ course to give you an eternal edge over learned people who have distinguished qualities complimented by hard work and perseverance. Among the plethora of courses thrown at our faces, Personality Development Courses are some of the courses that lure you to ‘transform’ yourself into a better person that the world has ever seen. In reality, many of these poorly constructed courses often make you shell out money and at the end leaves you unsatisfied. What is a Personality Development Course? Personality Development course is aimed to bring about a change in one’s personality focusing on areas of bringing out the hidden potential in a person. It is an organic process that helps to identify the ‘ifs’, ‘buts’ and ‘maybes’ while making a decision. In other words, a course designed to bring out confidence and present yourself in an articulate manner can be summed into a personality development course. Personality development courses focus on building confidence, ensures success in relationships and bringing in an inner sense of satisfaction. Many of us are not in touch with the true potential we hold within us; some of us know we can be better but at times do not know how. Personality development courses are curriculum that grooms our positive characteristics, behaviors, thoughts and feelings. For example, a person keen to express but shy to speak eventually ends up speaking the wrong words, tone or behave in a way that will not convey the actual message. One important thing to understand is that often the primary inhibiting factors in our personality brings with it other inhibiting/fear factors that prevents us from expressing ourselves clearly. Personality development is a peek inside those fears that prevent you from progressing. Think of it as a guided tour to your mind visiting each stop and looking face-to-face on the aspects of your personality objectively. At BAFEL Dwarka, this is what we show the students. And once the aspects are clear, a necessary change in actions often leads to new habits, paradigm shift and other useful elements into the student’s persona enabling a positive and wholesome growth in confidence. BAFEL Dwarka is one of our finest branches in Delhi where you can enquire and enroll about our courses. Enhance your personality with us with our unique courses that are fine-tuned to improve your overall persona. 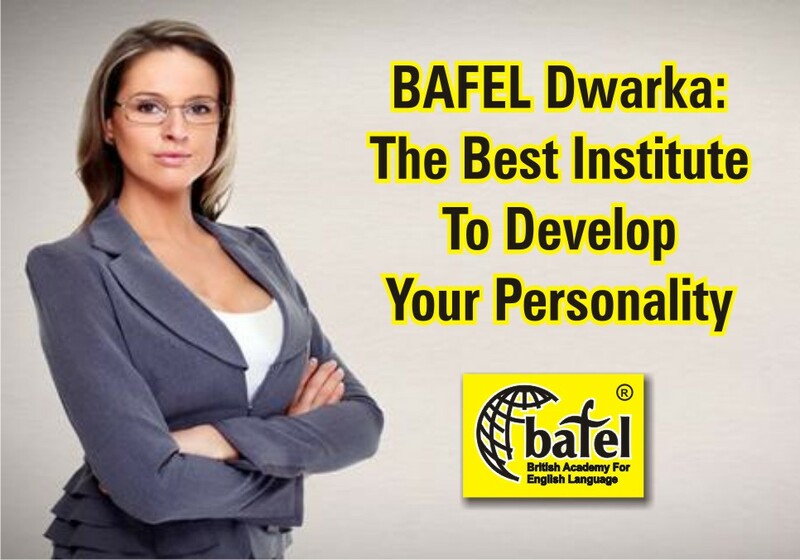 Be it personal relationships, group discussions, communication skills, personality traits or career growth, BAFEL Dwarka is one place you must visit. We have qualified working personnel and a proven track record of successful candidates passing out from our institute every year and making their dreams come true. With our intuitive methods, we are able to change patterns in people that inhibit them from progressing. We believe that it is never too late to begin anything. That is why we have been able serve many people and win their trust in due time. It is not that easy to be aware of one’s flaws, if any. But if you are willing to go the extra mile and bring about a change in the way you think and act, then BAFEL Dwarka is a place to begin with. Our Personality Development Courses can guarantee a turnaround in your persona with gradual changes that can fortify your personality’s foundation. Visit us today and look at our courses; contact our service desk in person at BAFEL Dwarka and get to know first-hands our offerings. Our courses for OET, TOEFL, IELTS, apart from personality development are recommended by many in Delhi and has befitted from homemakers to professionals alike.